Maybe your field service business never had a website, because you just never had the time. Or maybe you do have one, but it’s been the same since the 1990s—complete with flashing banners and scrolling text—and it doesn’t fit your goals of attracting bigger customers. Whatever the case, a missing or sub-par website means you’re missing out on potential jobs. Not sure you want the Kit? 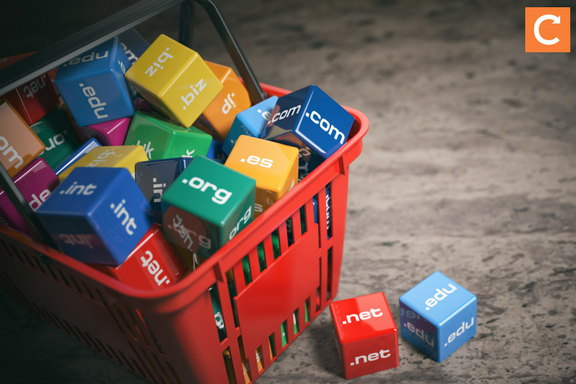 Get a sneak peek of our guide to domain names below. If you'd like the full Kit right now, you can grab it here. These steps will help you choose a customer-attracting domain name for your website. Ready for the details? Read on. Don't have a website yet? One of the first things you'll want to do is choose a domain, which is the part of your URL that comes after the www. And even if you do have a website, you may want to change your domain if you've come to realise it doesn't fit the image you want to convey to customers. The problem is, all the good names are taken. Not surprising, considering there are almost two billion websites online right now. No worries: Here are our expert-approved tips on choosing a domain name that works. Once you come up with a handful of likely candidates, run them by a focus group of customers. Write down the name and ask some of your customers to say it out loud, and say the name out loud to other customers and ask them to spell it. If people tend to mess up either the spelling or the pronunciation, keep looking. Of course, if you run a business with a name that's easy to say, easy to spell, and short, boom! You're done. Relevant keywords in your domain name can boost search engine results, as well. However, chances are the most desirable domain names for your business are already taken, in which case you need to get creative. Add a prefix or suffix to your keyword: Plumberrific, SuperHVAC, Heatify, Plumberly. Combine two words: HVACplumber, HeatExchange. Need help? Try Wikipedia's Glossary of HVAC Terms and PlumbingSupply.com's Plumbing Dictionary for ideas. Make up a completely new word (but be sure it's easy to say and spell! ): Evide, Methink, Marity, Remium. Just be sure your new word isn't too close to a real one or you could lose traffic; for example, TechCrunch reports that the popular photo site Flickr.com lost millions of visitors to the completely unrelated Flicker.com. Try a phrase: OnCallPlumber.co.uk, FixYourHVAC.com, FastBoilerRepair.co.uk. Again, test any potential domains with a focus group of customers before committing! They may notice problems with the domains that you didn't spot. The top-level domain (TLD) is the part that comes immediately after the dot, such as .com, .org, and .co.uk. Almost every guide to domain names tells you to stick with .com, and that's great—if you happen to be a global business. According to BackLinko, if you do business in only one country, using the TLD for that country, such as co.uk, will give you an advantage in search engine results. If you simply can't find a domain in your country's TLD or in .com, take a look at all the creative TLDs that have popped up in recent years. SEMRush has a good article on what to consider when looking for a new TLD for your domain. The good news is that these new TLDs don't negatively impact your search engine rankings. The bad news is that certain TLDs have bad business vibes—.biz and .info tend to be associated with spammers, for example—so research any TLD you're considering to figure out how it will impact your business's image. If you're having trouble brainstorming a good domain, let a domain name generator do it for you. NameStation lets you plug in a main keyword, additional keywords, and the top-level domain you want, and then spits out possible combinations. The only downside is that when you see a domain you like, you have to click "check availability" to see if you can buy it; in our tests, the most desirable domains the site comes up with tend to be unavailable. Wordoid will generate made-up words that somehow sound real and that roll off the tongue. (That's where we got the made-up words in our earlier tip.) Looking for a .com or .net domain? Wordoid will also let you know automatically whether the words it generates are available in those TLDs. LeanDomainSearch is just that: Lean and fast. It will generate tons of possible names in seconds, and the benefit is that the site lets you know straight off whether the domains are available. NameMesh does what the others do, except it sorts the results into categories for SEO-friendly domains, fun domains, newly available domains, and more. DomainsBot is similar, and will also give you options with all the unusual top-level domains like .build and .homes. 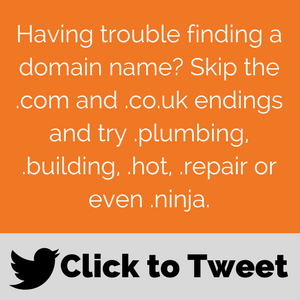 Even if ‘all the good domains are taken’, you don’t have to resort to an unprofessional, sales-killing domain name just to claim your space on the internet (1plumber4u.biz and HVASee.info come to mind). Your domain name counts as part of your overall marketing, so make sure it works. With these tips and a little research, you’ll create the perfect domain for your business. Want to get your hands on Build a Better Website: A Complete Kit for Field Service Businesses? Just click on the banner below for your free download. Enjoy!